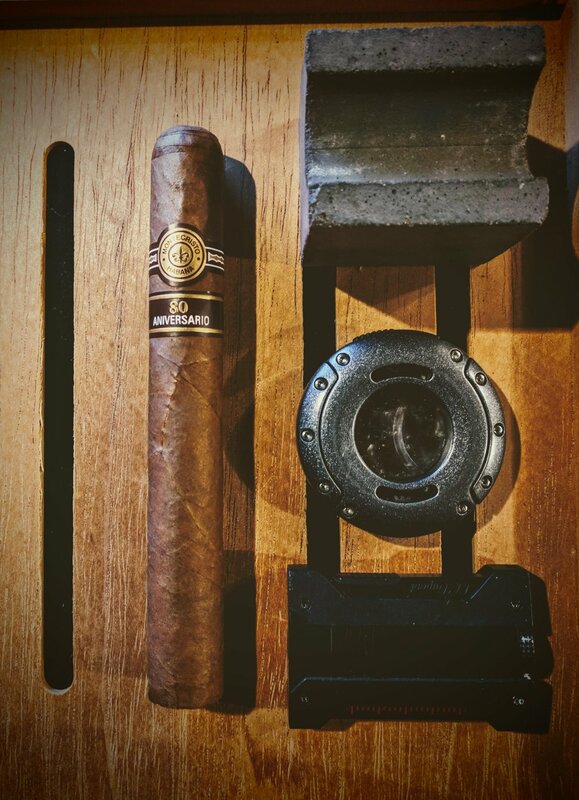 The Montecristo 80 Aniversario was blended and made specifically to commemorate the founding one of Cuba's most popular marcas. Alonso Menedez created the Montecristo brand in 1935 and it has been synonymous with Cuban cigars since. How did Montecristo get its name? Apparently The Count of Montecristo was an extremely popular and favorite novel of the cigar rollers in '35. While rolling, the book would frequently be read aloud - thus, leading to the name we know and love today. The cigar's launch was delayed about a year - due to some unforeseen circumstances that were never fully explained except to say that there were tobacco shortages that contributed. Scheduled to debut in 2015 - it wasn't really available until this year, 2017. The vitola's size is unique to any cigar produced by Habanos but seems to be in the same family as the Double Edmundo. This blend is supposed to be suited to smokers that favor more bold, full-bodied cigars - a little bit of a departure from the typically medium-bodied Montecristos. 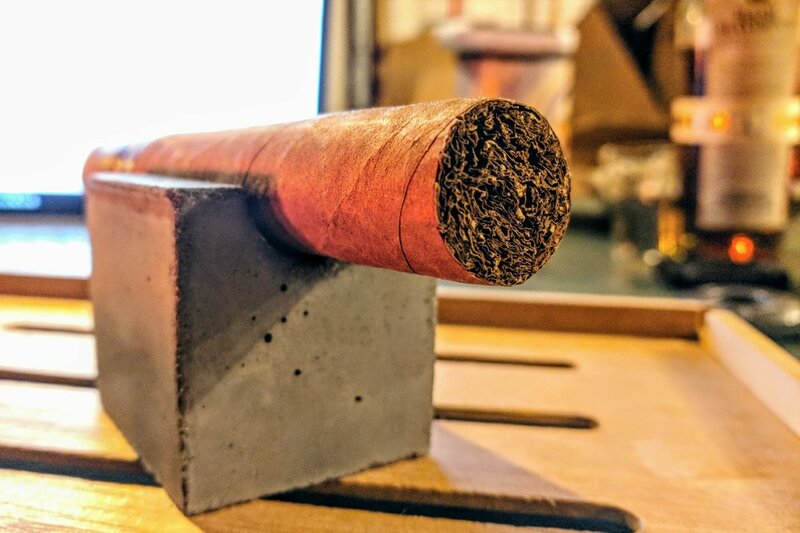 The cigar fully debuted at the Festival del Habano XVII in the form of three-pack style coffins - which seem pretty awesome and certainly an immediate collector's item. 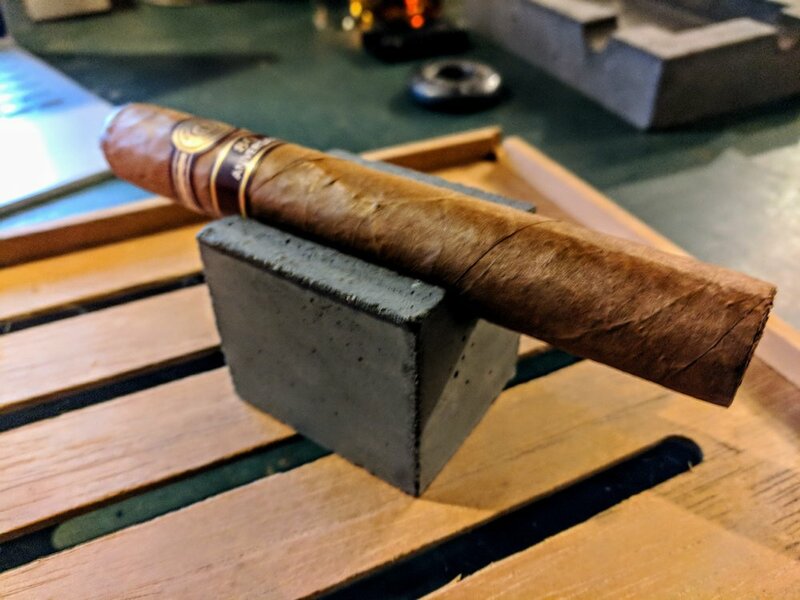 It's hard to get more classic than the instantly recognizable Montecristo band - even non-stogie smokers can probably instantly pick it out of a crowd. I'm glad to see Montecristo didn't work too hard to distance themselves from that iconic band. The 80 Aniversario just dresses up the typical band with a secondary band indicating the cause for the special stick. I will say the newer Montecristo bands with the gold/bronze hues don't do it for me the way the older brown/white bands did. I like the simplicity of a band that probably hasn't been updated in 75 years - it worked then, it worked 10 years ago, but for some reason they changed it. It's not terrible, just feels like an unwarranted update. The Monte 80's wrapper truly is emblematic of everything you want in a quality Pinar del Rio product. The veining is moderate and where present sits relatively flat. The color is a perfect uniform medium brown shade. There are a couple minor bumps and whatnot on the wrapper - but on a whole - the quality is impeccable. There's also a nice medium oily glossiness to the wrapper that is not photographing particularly well. It's a dense cigar. I lightly inspected the length of the body and there were no soft or overly hard areas - just a solidly constructed stick with almost no give whatsoever. The cap truly is a work of art - among the best I think I've ever seen. It is a triple cap the gracefully drops deep into the body while merging with the wrapper flawlessly. You can definitely tell some talented hands at the H. Upmann factory are behind these cigars. The foot doesn't lend much more to the conversation - just showing off a predictably well-rolled, densely-packed stogie. My sniffer is a little stuffed up at the moment, but even through it I can definitely get some strong cinnamon, moderate chocolate and a bit of cedar off the foot. It really smells fantastic. The cold draw has a medium maltiness to it that reminds me a little of a Whopper (candy, not burger). Not much else to report though. To snip my Montecristo 80th, I reached for my Xikar XO cutter and honestly, this is one of the first times I've really been thankful for it. The ring gauge on this stogie is pretty beefy at 55 and the clean cut with uniform pressure the XO cuts with worked excellently. Nothing worse than a bad cut on such a high-end cigar. The first few puffs are very smooth and mild - just a hint of pepper, some woody brininess and that typical Cuban twang. The draw is great considering the diameter of the cigar and the density. It has a nice, mildly resistant draw to start. As the cigar gets going, the burn line is a bit wobbly but nothing out of the ordinary as it finds its course. Overall, the cigar lit up wonderfully and all signs are pointing to a good experience to come. 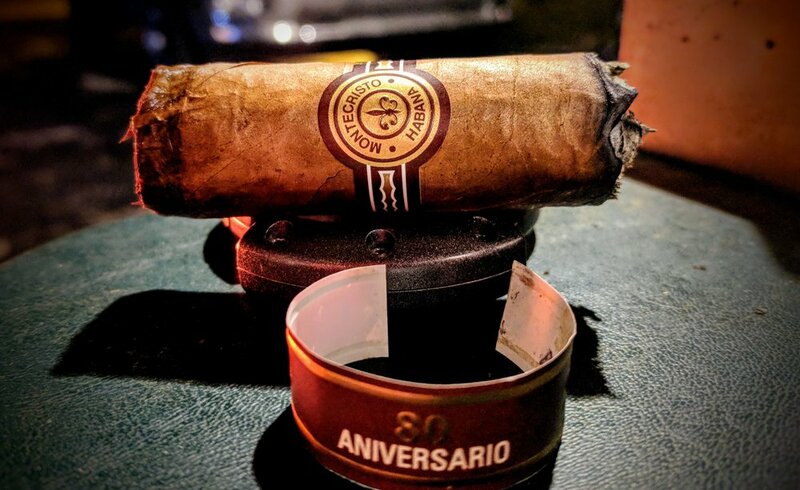 The Montecristo 80 Aniversario is either on or off. When you're smoking it, it churns out this wonderful smelling velvety white smoke. Resting, you'll get nervous you need to find a light for a quick rekindling. No complaints, just very dynamic one way or the other. About an inch into the cigar and there is a great creaminess to open it up. It's not a simple flavor though - there's complexity to it. It's almost like a very creamy, still-warm roasted peanut butter. There is a salt water brininess present - offering a good counter balance to the sweetness of the cream. Also lingering on the palate is a bit of rich black coffee and general woodiness or earthy flavors. As far as retrohales go, you won't find one much smoother - it reinforces the roasted nut and creaminess. So far, the draw continues to be great and the burn has found its place - razor sharp. Exactly what you'd expect from the care that went into this cigar's production. The ash dropped a little over a half-inch into the smoke, mostly a result of my lackadaisical handling. It is stacking very well to this point and has a marbled gray/white color with some pockets of black showing up sporadically. Into the middle third and the brine and cream are duking it out for top spot with the salty seawater winning at this point. The flavor is interesting but not one I'm super fond of at the forefront of a cigar's flavor profile. I like a little salt or acidity to balance the palate but this is a little on the high side for me personally. But it literally depends on the puff, the cigar will shift right back to the roasted peanut butter creamy goodness with a chocolate kicker. I think the saltiness really stays in the mouth though - a lot like raw oysters in that regard. Also, the twang you may expect from a Cuban stick is all but gone - honestly, it disappeared after the first initial puffs. Nothing has changed on the draw or burn - everything is going perfectly at about the midpoint. So far, I'd say this a medium to light-bodied cigar - the flavors are bold but it's not going to deter most smokers who favor a lighter body I don't think. The strength at the halfway mark is definitely mild to low medium. I have to say, the compounding nature of the saltiness really gets old around the final third. At first, it's a great counter balance. By the middle third, I wondered if the cigar was transitioning to a different flavor profile. At this point, I feel like I'm licking a block of salt. It's a little misleading too. The initial flavors on most puffs are not briny but then it rests in your mouth for way too long and way too much to where you forget what those initial flavors even were. The cream and roasted nut qualities have faded and been replaced, at least up front, with some charred oak, earth and mushroom - think more hen of the woods and less white cap - gamey and chewy mushrooms. While the draw hasn't let me down yet, there were a couple odd points on the burn. Part of the wrapper penisula'd itself and created a jagged condition. It remediated itself but got me a little nervous for a minute. 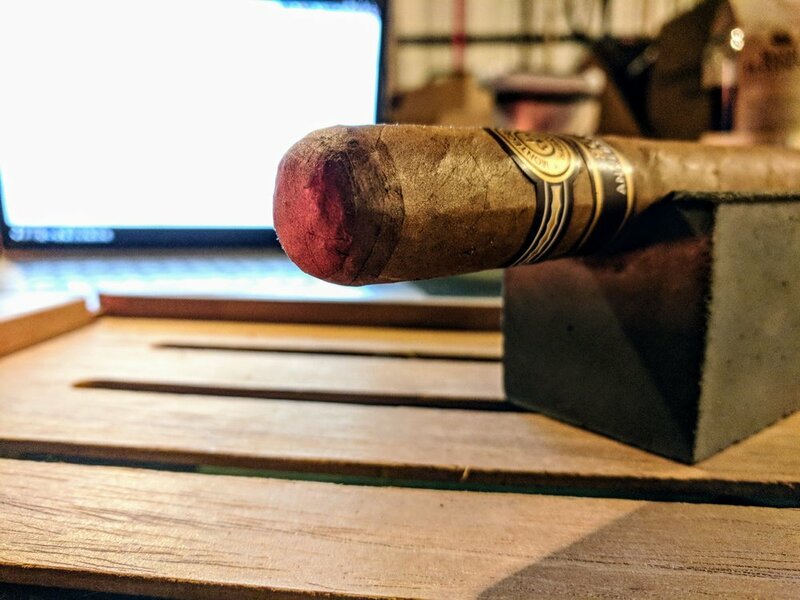 I really can't complain or dock the score much - overall this cigar has been a joy to smoke from a burn/draw point of view. The ash has darkened a bit and tends to hang to about the inch mark - which really is fine with me. There are some clear "stacks" or layers visible and it's sturdy enough you don't need to be too concerned about guarding your lap. The initial flavors were great but it didn't progress in a satisfying way. Did the flavors change? Sure. Was it enjoyable? No, not really. I really dug those initial well-balanced warm roasted peanut butter with the hint of salty brine. The cigar became dominated by the harsh brininess and by the end I was definitely over it. 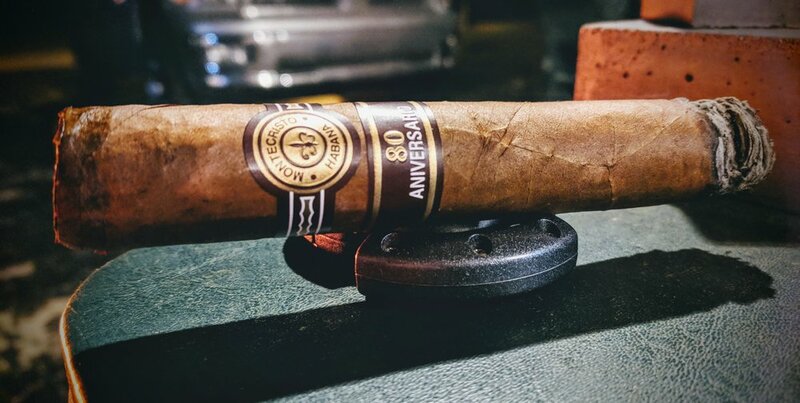 The Montecristo 80 Aniversario was certainly a labor of love to produce. It was a beautiful looking cigar that smoked near flawlessly. Absolutely no complaints about the experience - it burned smoothly, at its own pace and with relatively few issues. 👎 Did I mention the salt? 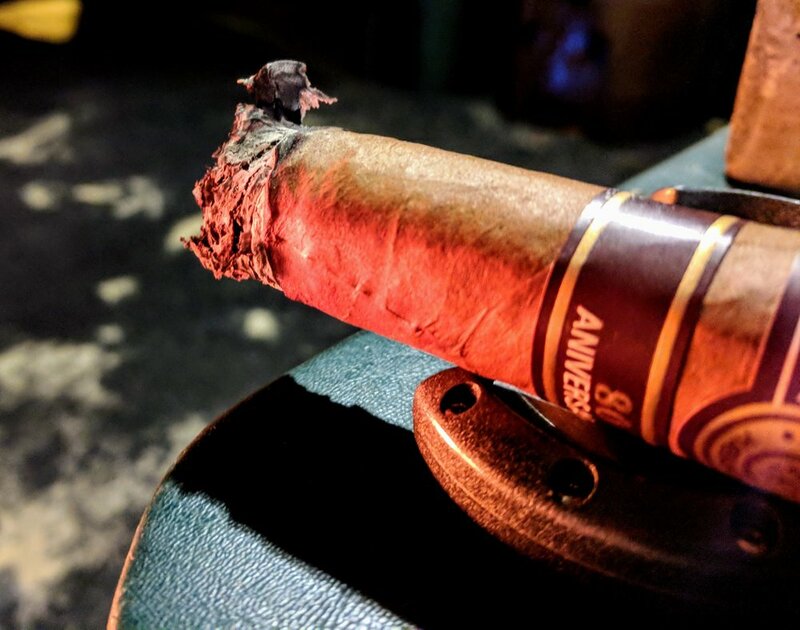 The Montecristo 80 Aniversario started out so well - balanced with deep, complex flavors and ended with a feeling of being drowned on the shores of Cuba. The flavors start out very promising and end up being a major let down. if you like salty cigars, this is the one for you. 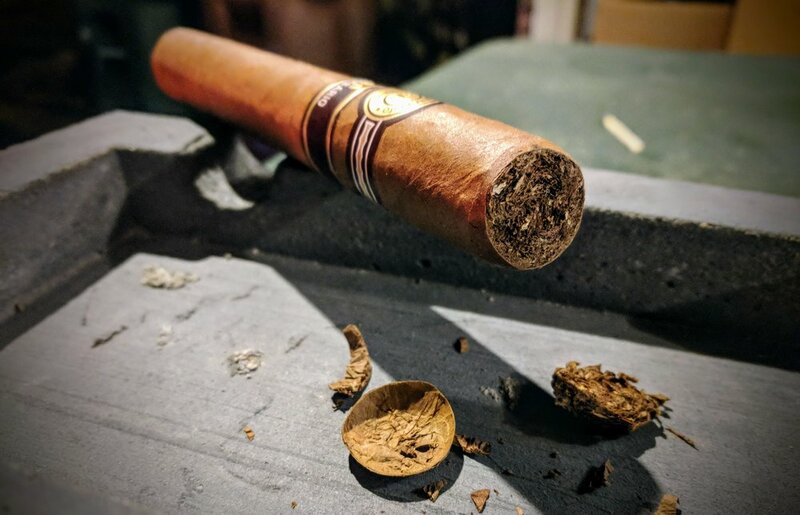 I'll definitely give it a second chance with some time to rest but for now, i won't be shelling out the cash to grab any more of these special stogies. For the money these cigars are marketed at, they really ought to bring some better balanced flavors to the table. Well, Charlie Minato over at Halfwheel loved the 80 Aniversario but he smoked the 2015 sample. I'd imagine the blend was pretty similar but who knows what happened between 2015 and 2017 when they released them. If they used the same leaves/blend, maybe the additional aging didn't do them any favors. Either way, I'll bury the few I have remaining deep in the humidor and pull one in a couple years to compare.